The Ottawa region is known for its impressive golf courses, many of which offer spectacular views of the Gatineau Hills, together with the Rideau Canal, St. Lawrence and Ottawa rivers. Appealing to all levels of golfing ability, most golf courses in the Ottawa area are just a short trip from the city. With driving ranges, golf instructors, clubhouses, practice greens and professional golf shops, most golf courses nearby Ottawa are open to members of the public. 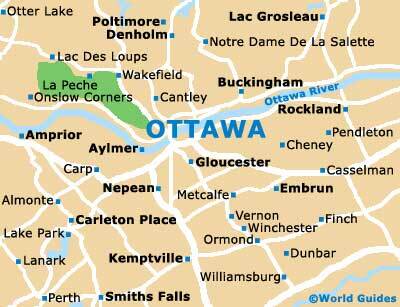 Here are Ottawa's main golf courses. Dragonfly Golf Course is a par 72, 18-hole golf course, situated 59 miles / 95 km from Ottawa. This challenging golf course has bunkers, water hazards, a well-stocked pro shop, golf carts and clubs and a driving range. The scenic Arnprior Golf Club is a championship 18-hole course, standing 41 miles / 66 km from Ottawa. This popular golf course overlooks the spectacular Ottawa River and features well-kept fairways, a pro shop, together with golf carts and club rentals. Loch March Golf and Country Club is a par 72, 18-hole golf course, located just 16 miles / 26 km from Ottawa. This challenging golf course features stunning scenery and exceptional fairways. The Marshes Golf Club was designed by Robert Trent Jones II and is located only 15 miles / 24 km west of Ottawa. With exceptional fairways and stunning surroundings, the Marshes Golf Club offers golf carts, impressive greens, a pro shop and fine dining facilities at the Bar and Grill. The Emerald Links is a par 71, 18-hole golf course and is situated just 15 miles / 24 km from Ottawa. With stunning landscaping, exceptional greens and fairways, a pro shop, a putting green, golf carts and club rentals, and a driving range, this challenging golf course also features a clubhouse and restaurant. Further highlights include a golf school with qualified instructors. The Capital Golf Center is an 18-hole golf course, located only 10 miles / 16 km from Ottawa, which is perfect for both the beginner and the more experienced golfer. With a driving range, a short iron range, golf club and cart rentals, and a snack bar, the Capital Golf Center also provides golf tuition for golfers wishing to improve their skills. Featuring two challenging golf courses, an 18-hole and a 9-hole course, Canadian Golf and Country Club is situated 26 miles / 42 km from Ottawa. This popular semi-private club also provides three indoor golf simulators and a fully stocked pro shop. Stonebridge Golf Club is a par 71, 18-hole golf course, situated just 16 miles / 26 km from Ottawa. Offering impressive greens and fairways, sandy bunkers, golf cart rental and well-maintained putting greens, the Stonebridge Golf Club also contains a driving range and a clubhouse. Cloverdale Links Golf Course is a par 71, 18-hole golf course, located 34 miles / 55 km from Ottawa. Featuring golf cart and club rental, and a fully equipped pro shop, Cloverdale Links Golf Course also provides professional tuition for golfers wishing to improve their skills. Meadows Country Club is a 36-hole golf facility, situated just 14 miles / 23 km from Ottawa. Offering an excellent practice range, water hazards, golfing packages and a popular clubhouse, Meadows Country Club can also host weddings, social and corporate events. Greyhawk Golf and Country Club, located just 16 miles / 26 km from Ottawa, is a challenging, public 18-hole golf course. With an array of bunkers, water hazards, impressive fairways and putting greens, Greyhawk Golf and Country Club also provides banqueting facilities. Situated just 5 miles / 8 km from Ottawa, the Chateau Cartier Resort features a challenging par 17, 18-hole golf course. Set amongst 152 scenic acres / 60 hectares, golf facilities here include a driving range, putting green, golf tuition and a well-equipped pro shop. Chateau Cartier Resort is an impressive resort with 129 luxury rooms and suites, together with a wealth of facilities.